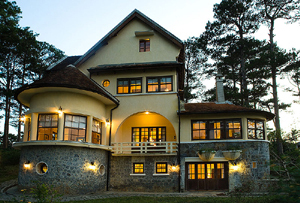 Nestled on the gentle slopes of the rural highlands, Ana Mandara Villas Resort & Spa is sprawled across 35 acres of parkland in the romantic city of Dalat, Vietnam. The hotel is only half an hour away by car from the Lien Khuong Airport. Foreign tourists flying in from Ho Chi Minh City can get to the hotel in about 45 minutes, while those coming from Hanoi can reach Ana Mandara Villas Dalat in less than 2 hours. The city of Dalat lies in the south central highlands of Vietnam. It is casually referred to as “The City of Eternal Spring” and equally known as “Le Petit Paris” in allusion to the scaled down version of the Eiffel Tower at the city centre. Dalat is home to the picturesque Xuan Huong Lake and the numerous European-inspired edifices that line its wide city streets. It likewise boasts rolling mountains and tree-lined terrain, making it a favourite summer destination. An individual kitchen has been restored for each villa, where our hosts will attend to all requests - from breakfast through to privately arranged 'In Villa' dining. A feature of each Villa is the surrounding landscaped areas and expansive views of local urban life and farming countryside. Room types range from Villa Rooms and Villa Studios through to Villa Suites. We also offer specially dedicated Villa Spa Suites for that extra pampering. For something truly unique, ask about The Bellevue Suite - with a breathtaking balcony and 270 degree views to match, or The Spa Villa - a fully contained originally restored chateau, complete with spa treatment facilities and private service host.